It's goodbye to Lancashire's fluorescent livery after 43 years! It was introduced with the arrival of the first diesel appliances in 1969. Known originally as Rocket Red, it was subsequently deemed to vivid and was in fact toned down. The latest batch of Daf LFs will are in standard red with Battenburg markings, following the introduction on 2 Prime Movers and repaints of some of the ALPs. The first appearance was at the 2012 Emergency Services Show at Stoneleigh Park 21/22 November 2012. A couple of pictures are shown below. The 2014 delivery of 6 new pumpng appliances had cabs built by Ziegler and bodywork by Emergency One. DAF LF PK63FUH was seen at SHQ, 25 July 2014. With bodywork by Emergency One, DAF PF65LML was seen at SHQ, 17 December 2015. New DAF PF65LMU was seen at the rear of Chorley Fire Station, 6 February 2016. New and unregistered Volvo ALP was seen at Chorley Fire Station, 6 February 2016. A superb line up of new Dafs shortly to be allocated. Ford Ranger PO16UXW is the Lancashire Air Unit. It was seen in Openshaw, [GMC] 19 February 2017. 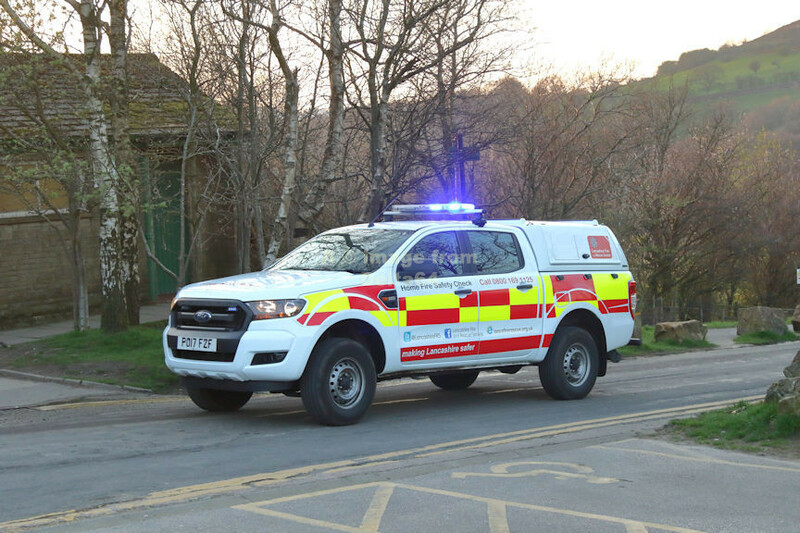 Ford Ranger PO17FZF was the Air Unit vehicle when seen on Saddleworth Moors, [GMC] 19 April 2017.